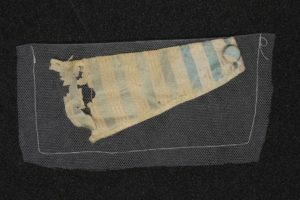 The Nelson & Norfolk exhibition contains some amazing textiles from the enormity of the ensign, brilliantly described in Lisa Little’s previous blog, to a delicate embroidered skirt flounce loaned by Royal Museums Greenwich Maritime Museum. 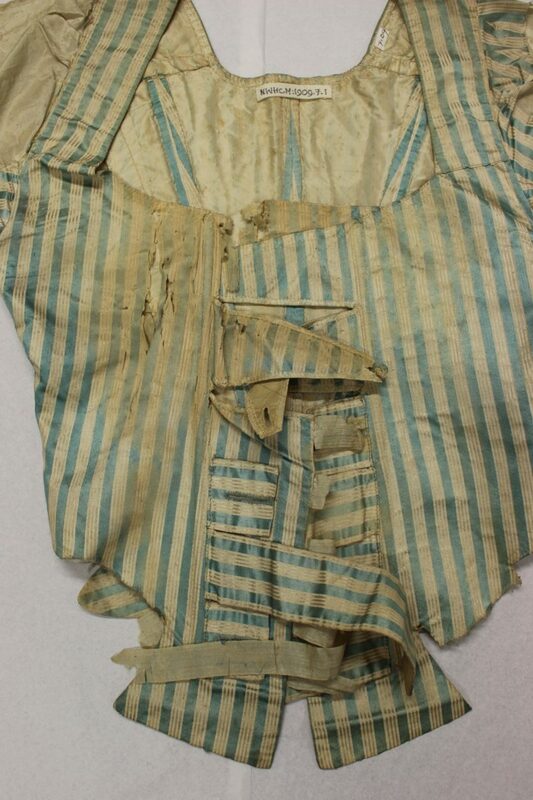 One of those textiles is a bodice alleged to have been worn by Marie Antoinette, the bodice is of blue and cream striped silk satin, lined with silk taffeta. A beautiful and luxurious item in its prime. Unfortunately, it has had a hard life. According to the accession file, the silk from the sleeves was cut out and given away as mementoes or relics to her admirers and followers after her death. It has also had a long life out on display and consequently has suffered from light damage across the front which is now very discoloured and in places almost in shreds. 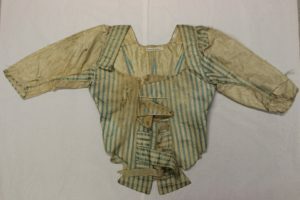 The bodice has been stored in a box with other items and is creased and squashed. 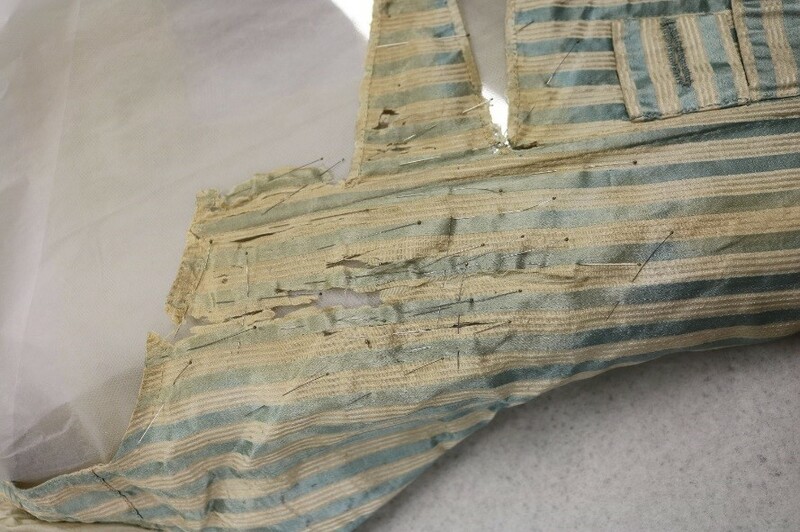 One piece of the fastenings has actually deteriorated so much it has become detached from the bodice. 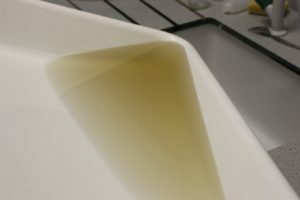 Which actually was quite convenient when it came to formulating a treatment plan. After much discussion with the Curator and the Head of Conservation, I decided to wet clean the bodice. As conservators we often clean objects as part of their treatment, it removes any dust, foreign materials, insect pests and so on, but we do not routinely wet clean historic dress. This is because of the information they contain and the history that the dirt and stains can attest to. 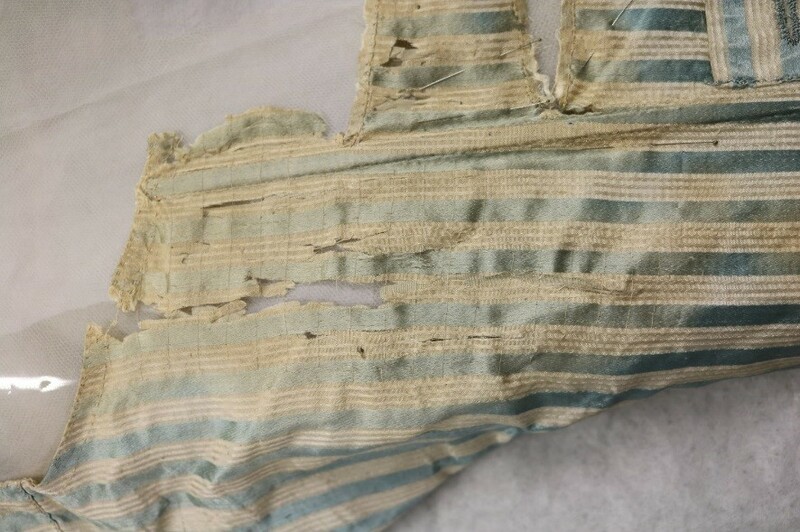 Historic dress is also often in a very fragile condition due to the materials it is made from and wet cleaning may put undue strain on already weakened fibres and threads. 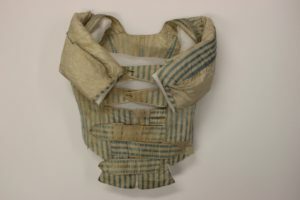 In this instance after I examined the bodice thoroughly I was sure that wet cleaning would be beneficial to the bodice in a number of ways; not only would it remove the dust and dirt from extended display period, it should lessen the discolouration across the front of the object by removing the deteriorated and discoloured fibres from the damaged area, but also it would rehydrate the silk fibres that had become brittle and in danger of cracking and hopefully give the satin back its shine. Detached piece prepared for wet clean test. Because of the good results gained from washing the detached piece, I decided to go ahead and wet clean the bodice. This is the water after the first lot of detergent was used on the bodice, the yellow is from the light damaged fibres and the grey tint is the dirt and dust from display and museum life. 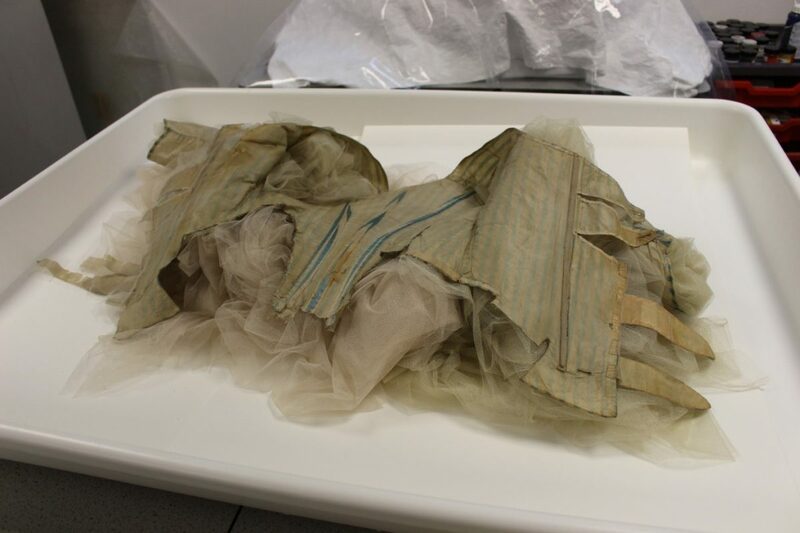 The bodice was dried with blotting paper to remove excess water and then laid out on piles of clean Nylon net. 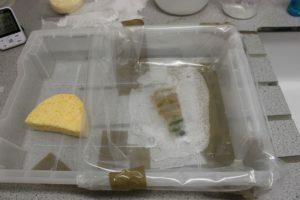 This allows the air to move around and under the object and reduces drying time. These images show the front right side of the bodice during the stitch repairs and after the stitching is finished. 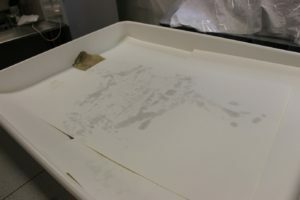 The silk is now soft and pliable and it feels safer to handle the fabric with less chance of damage from splits occurring. 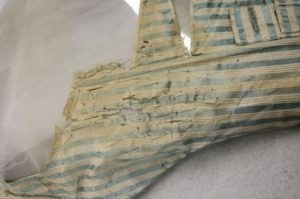 A layer of fine Nylon net has been pinned to the inside of the bodice behind the damage, the support stitching was worked through all the layers to hold the damaged pieces securely, and another layer of the net was stitched across the front of the damaged area for more protection. The detached piece was reinstated during the conservation process. 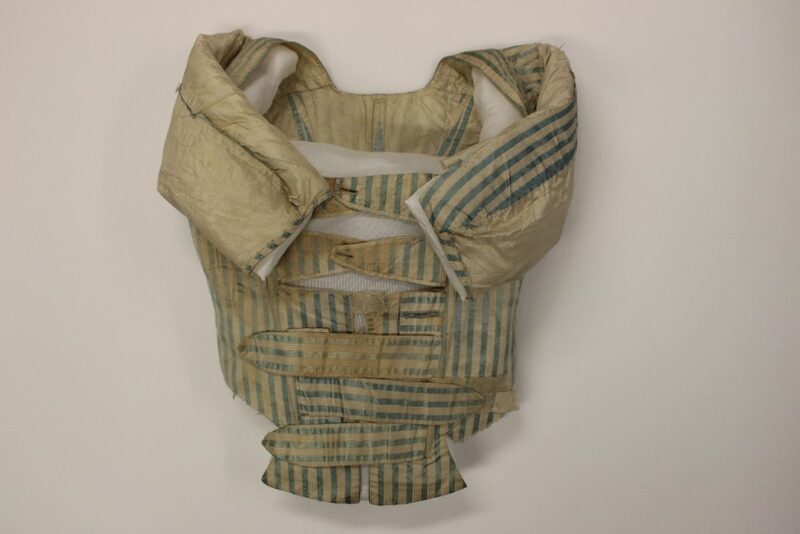 Due to space constraints in the cases, the bodice is displayed ‘flat’. When we describe an item of historic dress as being ‘flat’ what we mean is; not on a mannequin. The object will still need to be supported and to do this a bespoke internal mount was made, seen here part way through the process. 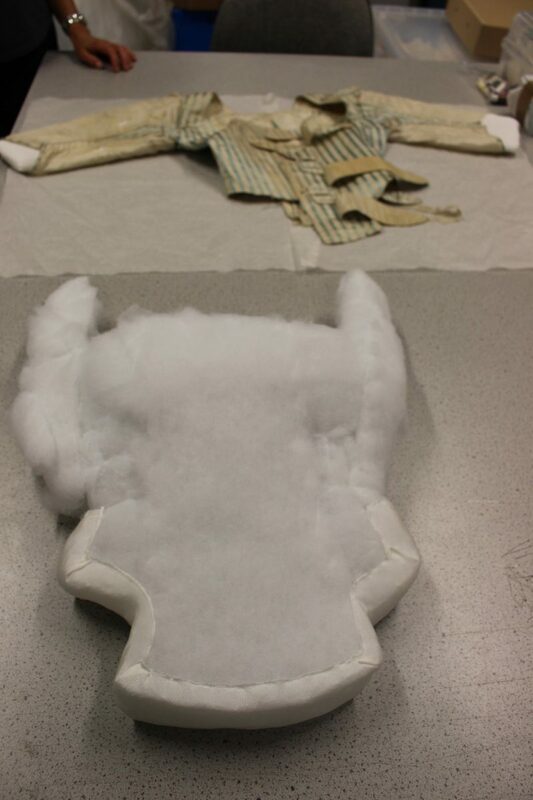 This mount will also be used for supporting the bodice in storage. 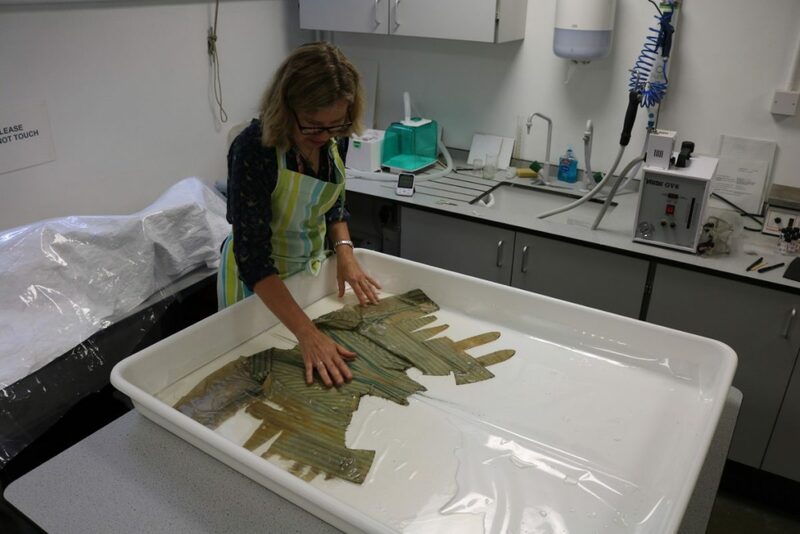 Every so often an object comes through the conservation lab that throws up questions and challenges, these objects are often complex, always interesting and very satisfying to work on. This object was one of those and I am pleased to have been able to conserve it for future visitors to see and enjoy.